Corsair had the bright idea of equipping three of its existing mechanical keyboards with a better backlight, hence the immediate availability of the K70 LUX RGB, K65 LUX RGB, and K70 LUX. If you haven't already picked up one of our highly recommended keyboards, the new LUX may interest you. In form, these are essentially the same as the non-LUX variants, each retaining its original aircraft-grade anodized brushed aluminum construction and Cherry MX key switches. The primary thing that's different about the LUX models is an enhanced internal lighting controller that allows for finer color adjustments, more vibrant patterns, and additional effects when paired with Corsair's CUE software. To help showcase the ultra-bright LED backlighting, Corsair equipped the key caps with a new and larger modern key cap font. According to Corsair, the laser-etched key caps will last through years of key clicks before wearing down. Beyond a better backlight and a new font, Corsair added USB pass-through to each of the aforementioned models. Apparently that's been something gamers have been clamoring for. "The full LUX range also adds a long requested feature to the Corsair family of RGB keyboards – USB pass-through. Now standard on all Corsair LUX keyboards, USB pass-through allows users to conveniently connect a mouse, headset, or other USB device directly to the keyboard for uninterrupted gameplay and easy access," Corsair says. As with the non-LUX models, each of the three new keyboards feature 100 percent anti-ghosting and full key rollover over USB, a detachable soft-touch wrist-rest, dedicated media controls, textured and contoured FPS and MOBA keycap sets, and choice of Cherry MX Blue, Brown, or Red key switches. 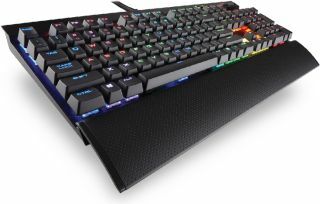 The K70 LUX RGB ($160), and K65 LUX RGB ($130), and K70 LUX ($120) are all available now.